Location/ Directions: Take Interstate I-65 to exit 74A, turn left at the second traffic light (at the Waffle House on your left), keep the Brentwood Hills (Target Shopping Center) on your right hotel, find the hotel at the bottom of the slight hill on the right side of the street. Speakerphone with Voice Mail, Free Local Phone Calls, Private Bathroom, Bathtub, Hairdryer. Railroad View: Fair to Good View. Need a room on the back side of the motel to view the railroad. The railroad end of the building would be best. Some brush along the railroad blocks what would be a good railroad view. Winter time may provide a better view while there is no foliage on the tree's. (as seen in aerial photo). Notes: This is a former Comfort Inn motel. 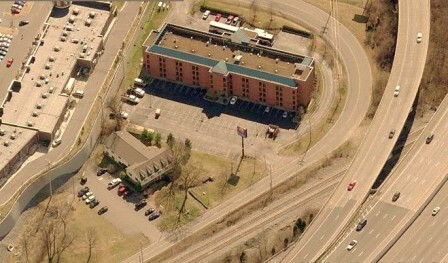 Photo Comment: The winter time aerial view shows the rear Holiday Inn Express (green trim on roof). The double track railroad can be seen passing behind the motel and under the I-65 interstate. 2nd to 4th floor rooms will be best to keep above the parking lot.